As a lowly beer neophyte reading raves about California's The Bruery on all the cool blogs, I made a pact with myself to hunt down some of their beer. This was the first thing I found, and I purchased it blind, price tag be damned. I had no idea what I was in for, but the label was pretty and it even had a fancy strip of tape covering the cap. The guy who sold it to me said "It's really good. Boozy, but good." Well, I drank it and my face melted. My original notes on this said it was very good but "maybe a bit too powerful". It was a real eye opener though. I'd never had anything like that beer before and it really pushed the boundaries of what I thought beer could be. It was a memorable experience and I can still recall the night vividly, right down the movies I was watching as I partook. I even saved up some shekels and bought another, with the thought that some of that booze would mellow out over time. And thus it's been burning a hole in my fridge for about 2 years now. 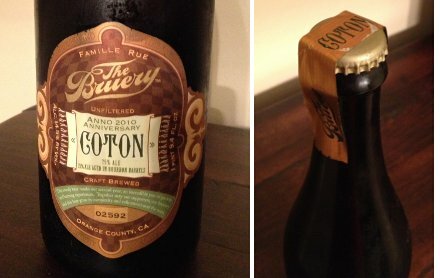 Coton was The Bruery's second anniversary ale, part of a series of beers named after traditional wedding anniversary gifts. 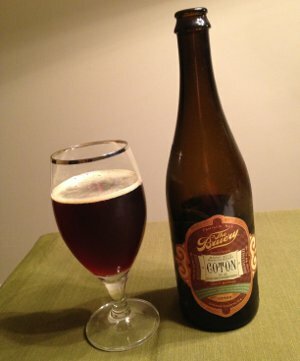 The first anniversary beer was called Papier (French for "paper") and it was brewed in the style of an English Old Ale, but using The Bruery's house Belgian yeast strain. Coton uses the same recipe as Papier, but they blended a portion of Bourbon Barrel Aged Papier into the "young" beer to add complexity. The fancy shmancy term for this process is the Solera method. Each year, young beer is blended with previous batches, adding complexity and creating an older average age to the beer. The process is typically used in the production of wine and appears to be exceedingly rare in the world of beer. Aging beer is an expensive proposition for most breweries and a Solera project requires a great deal of foresight, ambition, and planning. Fortunately, The Bruery is clearly up to the task. I've been purchasing these Anniversary beers every year, but truth be told, knocking back a 750 of 14.5% ABV beer takes something of a commitment. But it's been nearly two and a half years, I figured it was time to clear a few hours of the ol' schedule and bite the bullet on this thing. I've had beers that were rare or hard to get before, but this one weighed on me more than I expected, perhaps because it loomed so large in my mind. I know the general beer nerd consensus on this beer is mixed, but I have a personal connection with this beer that most don't share. It was a beer of firsts for me (first Bruery, among my first Barrel Aged brews, first time I broke the $20 barrier, and probably the highest ABV beer I'd had at the time, though I've long since surpassed that), and while I loved it the first time I had it, I'm always a little anxious about revisiting beers from that period. Am I putting it on a pedestal? Will this hold up to my expectations? Well, I'm happy to report that it actually managed to exceed expectations... to the point where I'm even going to award it the vaunted Kaedrin A+ (only beer so far this year to earn that distinction). Beer Nerd Details: 14.5% ABV bottled (750 ml capped and taped). Drank out of a goblet on 10/27/12. Bottled May 2010. Bottle Number 02592. 75% Ale, 25% Ale Aged in Bourbon Barrels. So there you have it. I've got bottles of Cuir and Fruet (3rd and 4th anniversaries, respectively) in the cellar, and some other Bruery whales are incoming, so stay frosty folks. This is looking like a Bruery-filled, liver-destroying, wallet-lightening winter. Whoa, a perfect 10! It's like the Nadia Comaneci of beer. And that sounds like a good winter. I thought Fruet was mind-blowing. So complex. I respect your discipline in managing to age this one. I certainly don't hand them out that often, but I think that's ok. In this case, I think I'm majorly biased, but thats part of the fun of rating stuff. As for this winter, it will most certainly be awesome. I don't want to jinx anything, but I have dibs on some pretty big Bruery beers (some sour, some bourbon barrel aged, some even bigger than Coton). Exciting! This page contains a single entry by Mark published on November 5, 2012 6:57 PM. Oude Gueuze Tilquin Made a Believer Out of Me was the previous entry in this blog. Ommegang Scythe & Sickle is the next entry in this blog.